Faster broadband connectivity and improvements in home networking technology have finally led to the emergence of the connected home — and it's been worth the wait. Whether it's streaming movies on-demand, securing a property using a Wi-Fi connected surveillance camera or downloading files from a home server, the connected home allows you to consume content and receive information from internet-connected home appliances at a time that suits you — not broadcasters. Now, thanks to processors built on 14nm chip manufacturing technology, Intel has introduced the ultimate companion for the connected home. Called the Intel NUC, Intel's small box is a fully functional PC that measures just 115 x 111 x 48mm and packs the latest fifth-generation Intel Core i5 and Core i7 processors. All you need to do is three simple things - add some memory, a storage solution (a laptop drive or SSD) and an operating system (Windows or Linux) to get things off the ground. Supported operating systems include Windows 7, Windows 8.1, Ubuntu, Linux Mint, Fedora and OpenSUSE, in addition to Windows 10, which can be installed as a free upgrade to Windows 7 and 8.1 users from July 29. From there, the NUC can be customised to suit your needs. Do you use it as a gaming machine? A media server? Or a home theatre? The choice is yours. The NUC is the antithesis of hulking, noisy gaming PCs. Energy-efficient and discrete, Intel's NUC5i7RYH - the most powerful NUC ever - comes equipped with a Core i7-5557U processor and Intel Iris graphics 6100 to deliver immersive and life-like gaming experiences. There are more people using Intel for gaming than ever before. A fifth of all users (there's roughly 125 million in total) on Valve's Steam gaming platform were using Intel graphics in July, according to the company's monthly gamer survey. And you're not restricted to the bedroom: HDMI and mini DisplayPort 1.2 connections mean you can hook a NUC up to a living room TV or PC monitor while enjoying cinematic 7.1 surround sound. Going to a LAN tournament? The NUC's small stature allows you to slip it into a bag for easy transportation. The NUC's expandable storage up to 2TB makes it equally suited for use as a media centre or home-theatre PC, meaning you can keep all your files in one location while backing up to the cloud to keep them safe. 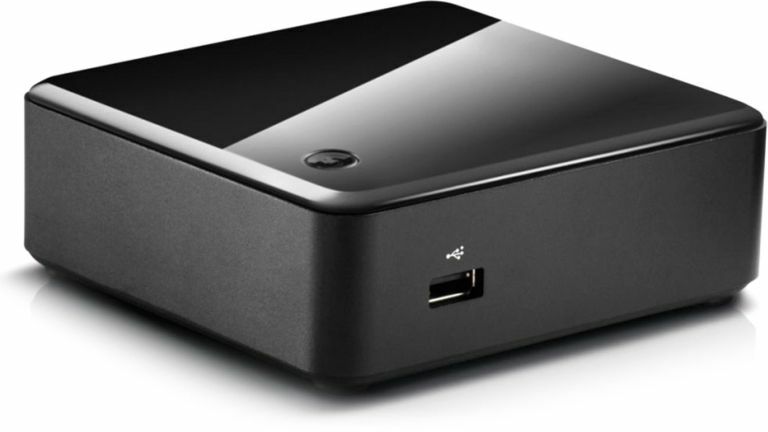 The NUC5i5RYH1 has plenty of room inside including space for a 2.5-inch SATA3 HDD or SSD (up to 9.5mm thickness). That means you can store plenty of full-length movies, family videos or TV series before showing them off in glorious 4K running at a super smooth 60Hz. Alternatively, opt for lightning-fast data speeds by inserting a M.2 SSD card (22x42, 22x60, or 22x80). If your life revolves around the cloud, the NUC's 10/100/1000Mbps Ethernet connection and Intel's own 802.11AC Wi-Fi chip ensures that streaming content is stutter-free. The NUC even ships with features including a built-in infrared sensor for using a remote control, allowing you to control it from the comfort of your couch. At its size, the NUC can easily sit next to a keyboard or be tucked away at the back of a desk. Each NUC comes with a VESA mount and screws, allowing you to attach it to a TV or display to create your own all-in-one. And because it's capable of running the most demanding applications - in addition to displaying your screen's contents on up to three monitors at the same time - the NUC can increase your productivity when working on anything from documents to multimedia editing, coding and digital design. Six USB ports (x4 USB 3.0 and x2 USB 2.0) are thoughtfully positioned on the front and back panels to make hooking up peripherals a breeze — and they can also be used to charge your smartphone, tablet or other device when the NUC is idle or off. Those USB ports can also be used to connect an IP-based security camera for storing surveillance footage to disk while keeping your home safe. Built-in Bluetooth 4 connectivity makes for a hands-free alternative, while Intel Wireless Display allows you to cut out cables altogether by beaming contents to a monitor wirelessly. Bluetooth also allows you to use the NUC as your home's music hub, able to stream music up to 30 feet away. With the Intel NUC you can hold your digital life in your hand — and you'll have the peace of mind of a three-year warranty as standard.